As a graphic designer, I've always enjoyed looking at ads. When I went to ASU I studied advertising in the Business College, and I remember going to see the Clio Awards, which were shown over by the Art Building every year, which showed the best commercials of the year, chosen by people in the industry. Thirty years later, they're hilarious. I still get a big kick out of looking at old ads. And times really have changed, even in my lifetime, ads aren't quite as tricky as they used to be, new laws have been enforced which at least try to provide "Truth in Advertising". We've gotten used to ads that no longer come right out and lie, and promise things that nobody in their right mind would believe. 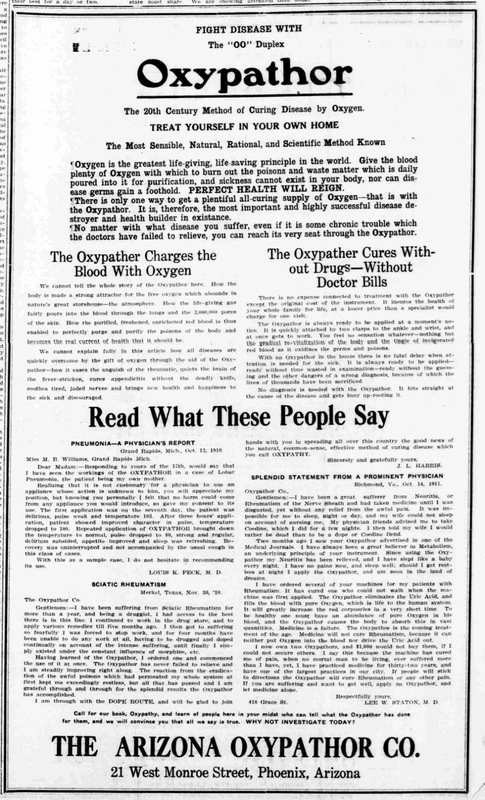 I grabbed the image above from my collection of old advertising in the Phoenix area, which was for the Oxypathor, which apparently would cure any disease. And it's funny, but it also worries me a bit. I've often joked about "Chamber of Commerce" promises, or how newspapers would "boost" their town, and it is funny to read that apparently Phoenix was always pleasant, never too hot or too cold, and any crop could grow there. Rivers flowed year 'round, and deer and antelope played. The idea of this type of advertising is to convince people of stuff, and a lot of the boostering was just as ridiculous as that ad for the "Oxypather". But every once in a while I see that someone has found an old article and has recently learned that Phoenix wasn't hot, and that no one ever got sick, or died. And it's probably because most people nowadays assume that what was printed in newspapers, both in ads in in the editorial content, was as responsible as it is now. But it really wasn't. 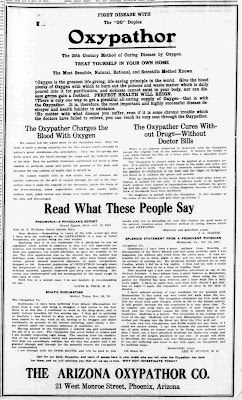 If you're outraged by the promises made by advertisers and the allegations made by newspapers nowadays, you really have to read a 1911 newspaper. I do it all of the time at the Library of Congress. If I've learned anything in a long life, it's good to take statements from ads and newspapers with a grain of salt. If you go back 100 years, you may need a whole salt-shaker!